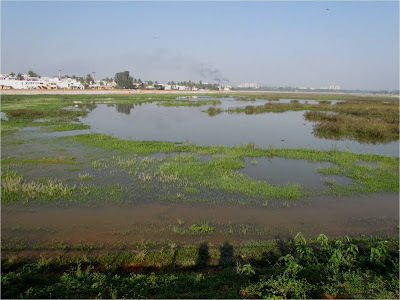 Recently, Yelahanka Lake was developed by BBMP. For once, instead of dredging the lake into an uniform depth, the lake-bed was scrapped to have a gradual slope towards the main bund. Thanks to the recent cyclonic storms in the Bay, the lake is 3/4th full with about waist deep water near the bund. Although the water is near clear, there is still some sewage mixed-up in it (mainly due to the inflow from the Puttenahalli Lake in the upstream). The overall effect of this is quite evident in the diversity of birds it supports. The lake looks like a hemi-marsh with about 1/3 of the waterspread area covered with emergent vegetation (see the first image & don't miss the clearness of water). 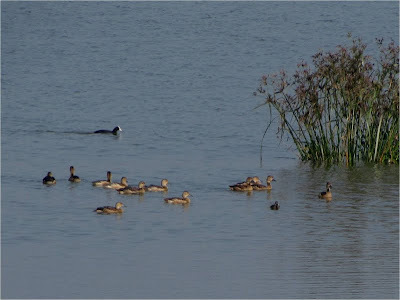 The second image shows part of the Lesser Whistling-duck flock and single individuals of Coot and the migratory Garganey.